I had some left over of cheddar cheese that was beginning to go hard in the fridge, rather than letting them go to waste I used it to make these delicious buns. 1. 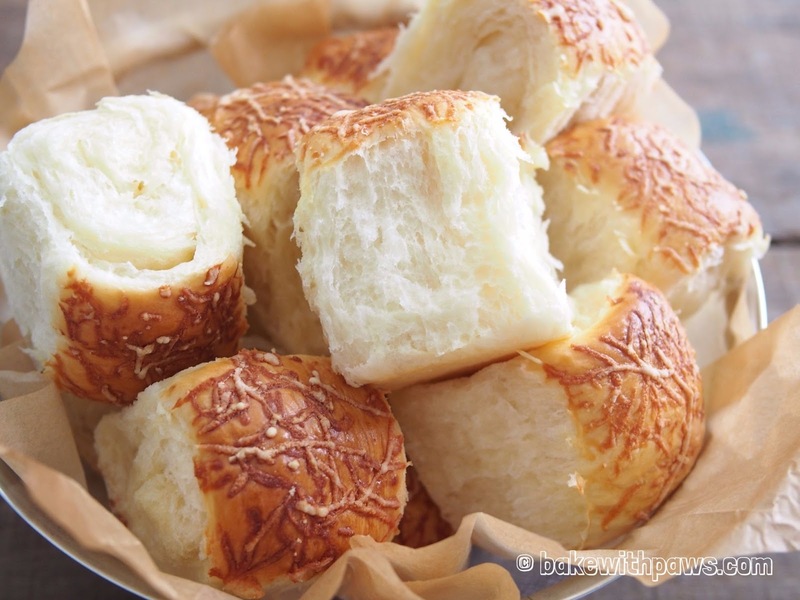 Put all ingredients (except cheese) and Tangzhong dough in a bowl of stand mixer and knead till the dough come together, until achieve window pane stage (the dough at this stage should be able to be pulled and stretched into membrane). It takes around 10 to 15 minutes. 3. Punch down the dough to release the air. Transfer the dough to a clean floured surface then divide into 16 equal portions. 4. Roll out each dough with a rolling pin into long rectangle shape. 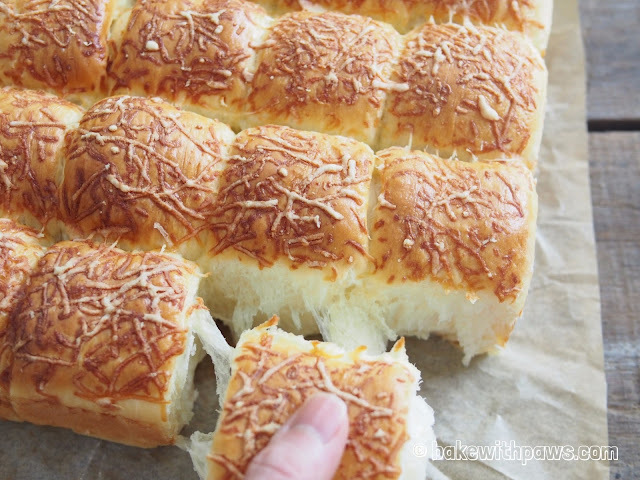 Sprinkle grated cheddar cheese on it and roll up like swiss roll. Place all dough in the square baking pan lining with non-stick baking sheet. Let it rise for another 50 -60 minutes or until double in size. 5. 15 minutes before baking, preheat the oven to 180°C. 6. Brush with egg wash and sprinkle with some grated cheddar cheese. Bake for 15 to 20 minutes, or until golden brown. 7. Remove from the oven and transfer onto a wire rack. Let cool completely. Thank you for the recipe! I love tang zhong bread!